Q:What are the dimensions of the box it is packaged in? Q:What does the label say under 'the perfect mix.' I cannot make out the words from the picture. Thank you! 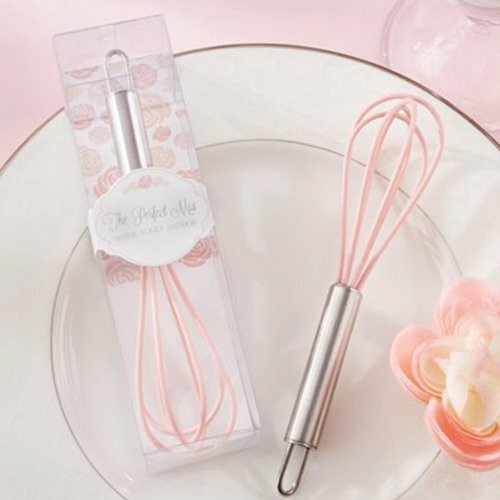 A:"Whisk - Fouet - Batidor"
A:it reads: 'The Perfect Mix"
Whisk up the perfect bridal shower favor with help from "The Perfect Mix" pink kitchen whisk. These cute whisks are individually packaged in its own gift box, ready to give out to guests. This is the perfect accessory for chefs, recipe lovers, and foodies!